Considered by many to be the Rolls Royce of German trumpets, the hand made instruments produced by Monke of Cologne are sought after and used by many of the best players in the world. 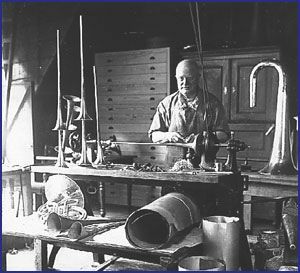 Here is a wonderful photo of Josef Monke at work in 1934 in the workshop. This entry was posted in The Trumpet o-iii<O and tagged Josef Monke, Monke trumpet. Bookmark the permalink.